I got hitched to the lovely Jasmine (@mountain_maiden) in September! 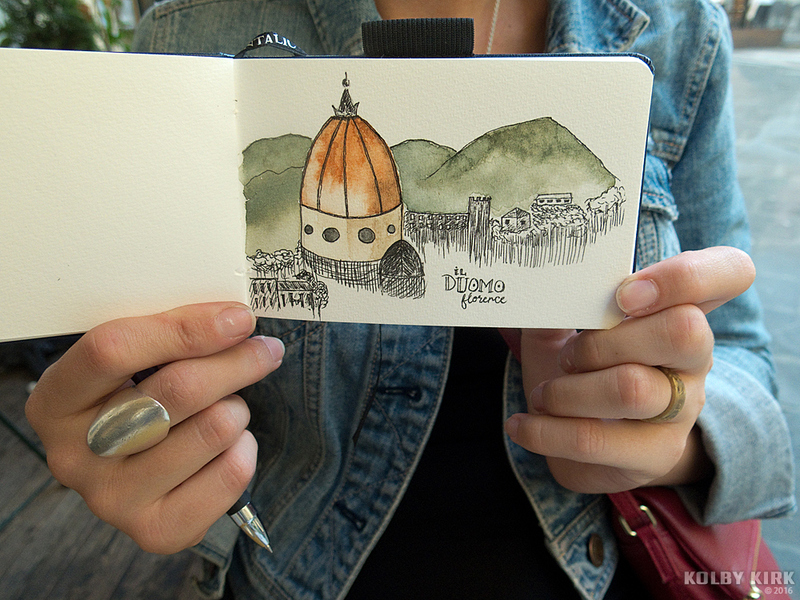 For our honeymoon, we spent sixteen days exploring Italy by backpack. All the while, I tried to keep the habit of journaling, as I’ve done for the last 15 years of exploring. 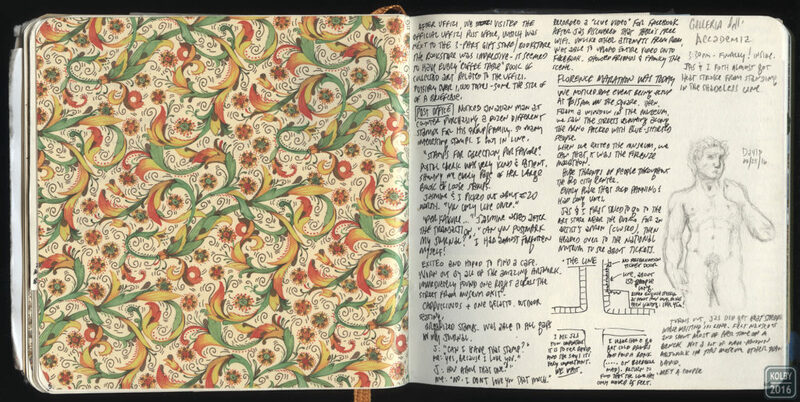 Lucky for me, I married a woman who also enjoys keeping a journal and a sketchbook. 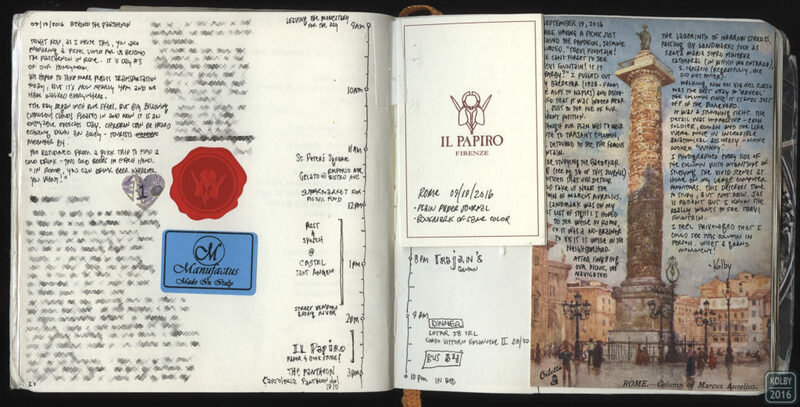 This is the story of our honeymoon from the perspective of our travel journaling. I’ve traveled with a Moleskine in my pocket for over a decade (read posts here, here, or here), but I felt like it was time to try a new book. In 2015, I bought a Travelogue Artist Journal made by the Hand Book Journal Co. for writing and sketching on the trail. 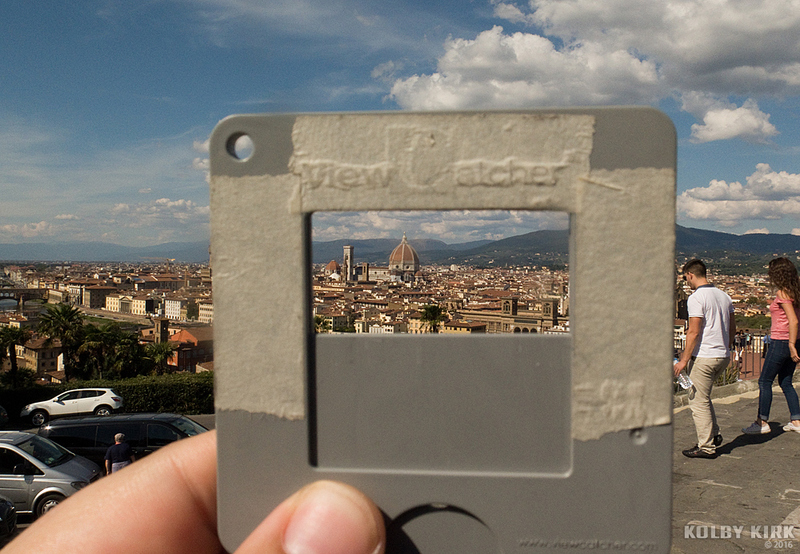 The 5.5 x 5.5 inch journal (nicknamed “The Square”) has held up pretty well in the rugged outdoors. Plus, I found the size and shape nearly perfect for a big guy like me, so I bought another to use to record my thoughts, ideas, plans, and events surrounding our honeymoon. The large page acreage offers so many more possibilities than a smaller books. 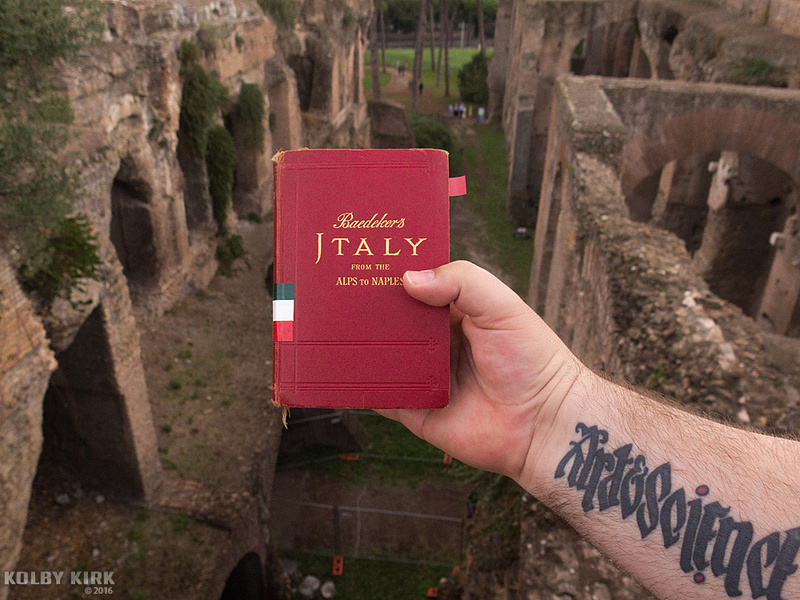 Along with my journal, I also carried a 1928 edition of Baedeker’s Italy from the Alps to Naples. I have a collection of over 100 guidebooks from 1880-1940 that have been heavily used by their previous owners. 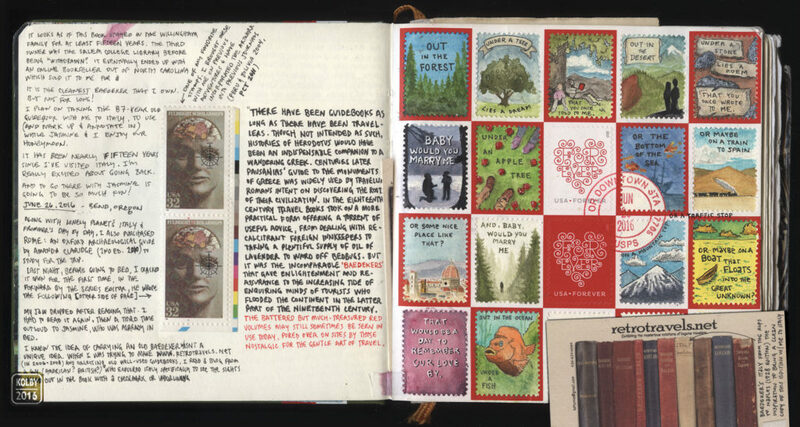 The books have visible signs of their journeys found within the pages of the book in the form of marginalia, pressed flowers, or ticket stubs. Years ago, I wondered what it would be like to travel with an old Baedeker (some call this “Baedekering”), so when this exciting adventure with my new wife started to form, I found a clean copy and brought it with us. It was my main guide throughout our journey and was surprisingly accurate still, after so much time since it was published. 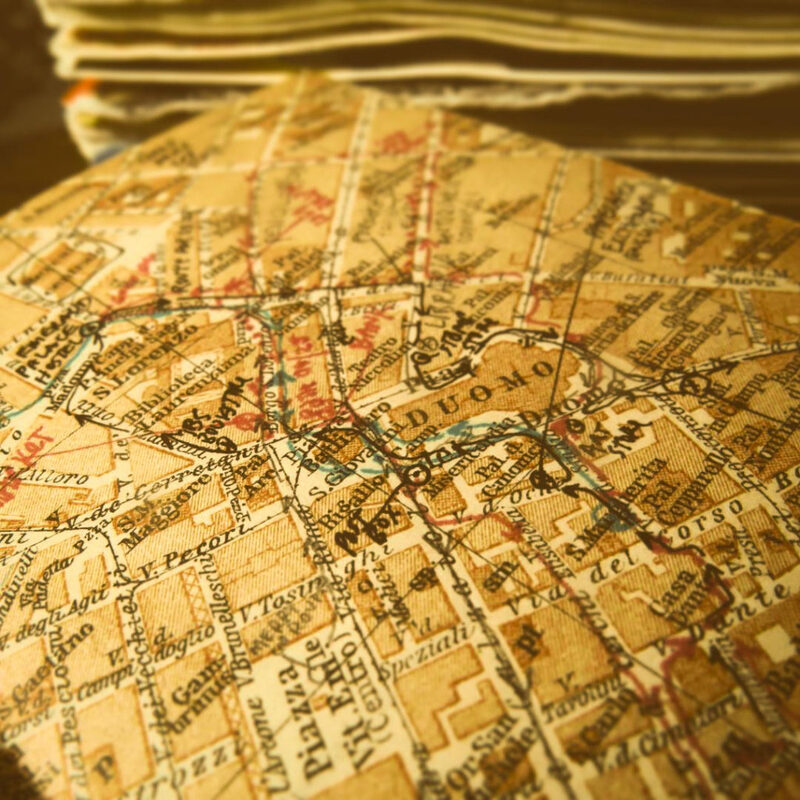 Train routes, most city street maps, and museum guides were all helpful in pointing out what has stayed the same and what has changed after nearly a century had passed. I added my own marginalia to its pages and maps to make the book my own. This book will accompany my journal until, many years from now, it finds its way to someone else. Jasmine and I had a great time traveling together through the history-rich cities and towns of Italy where we could find quiet streets to wander down and cafes to enjoy cappuccinos. 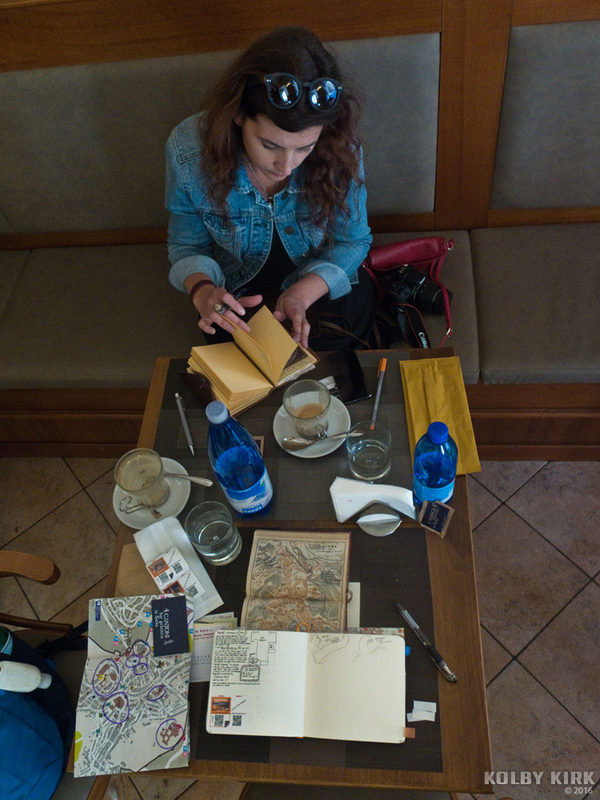 I tried to journal on foot as much as I could, jotting down observations in notes and sketches, but every other day or so, we’d spend some time at a restaurant or cafe updating our journals, like we did at this cafe in Siena. I had great expectations to spend time watercolor painting while in Italy, but there’s only so many hours in the day and I didn’t dedicate as much time to the activity as I expected. However, those rare moments when I put brush to paper were meditative and unforgettable, like the afternoon we spent at Piazzale Michelangelo above Florence. Jasmine carried a small watercolor journal, also made by Hand Book Journal Co.
We were suckers for any art or paper-related store we happened upon. 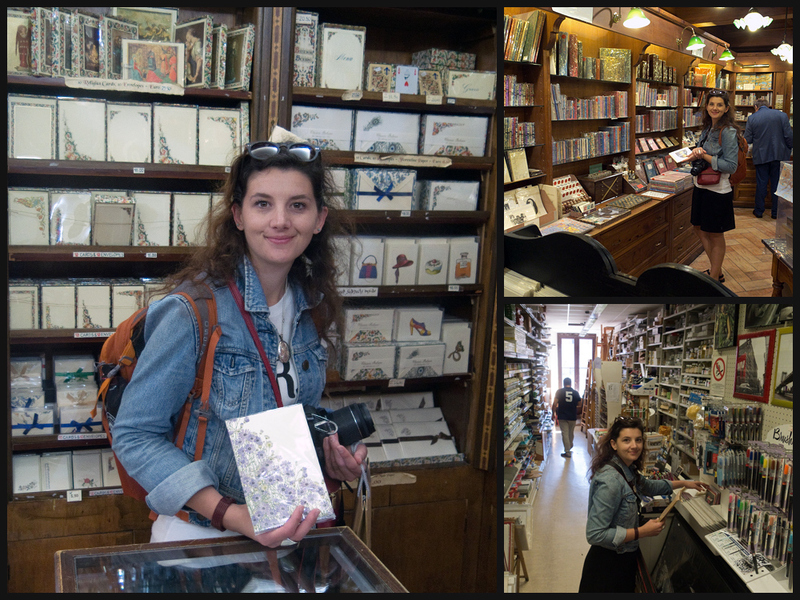 Some of our favorites were Il Papiro (Rome, Siena, Florence), Salvini (Florence), and Cartoleria Accademia (Venice). We bought stationery to use in our journals and bring home for art projects in the future. In an art supply store, I found a cool three-sided 4H graphite pencil called the Stabilo Trio. 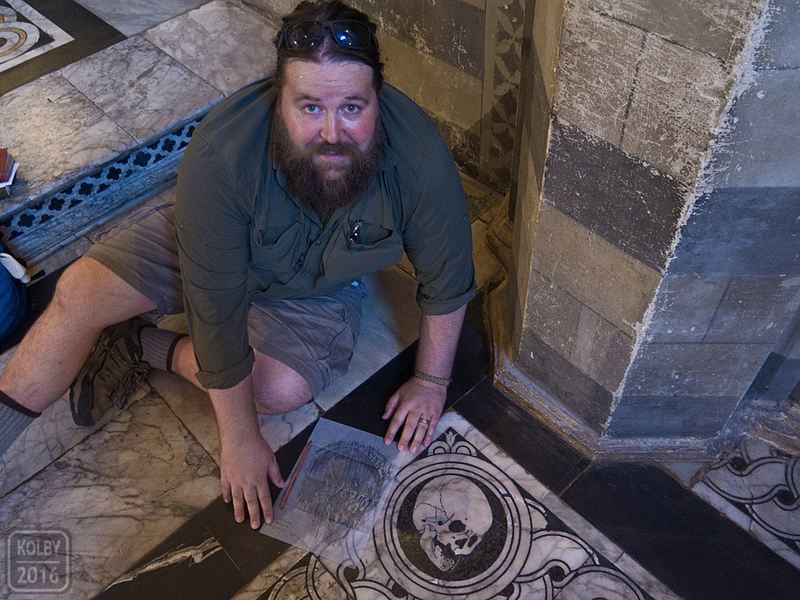 That, along with a piece of parchment paper I brought from home, I was able to take a rubbing of this beautiful skull artwork found on the marble floor of the Baptistery of San Giovanni in Siena’s Duomo. 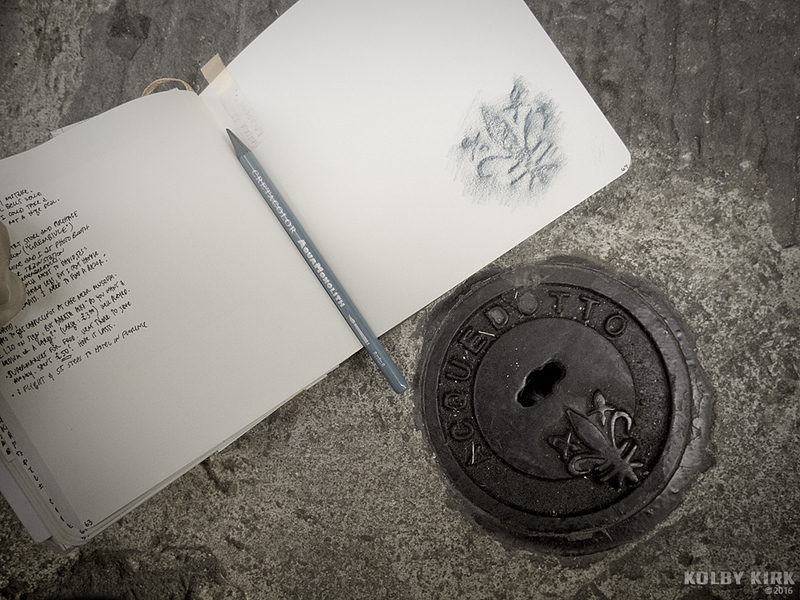 The fleur de lis, called a giglio in Italy, was incorporated into the crest of the city of Florence and can be found everywhere – including this small plumbing cover found on the sidewalk. I used one of Jasmine’s new watercolor pencils to make a rubbing directly on the page of my journal. Beauty can be found everywhere, even in drain covers. 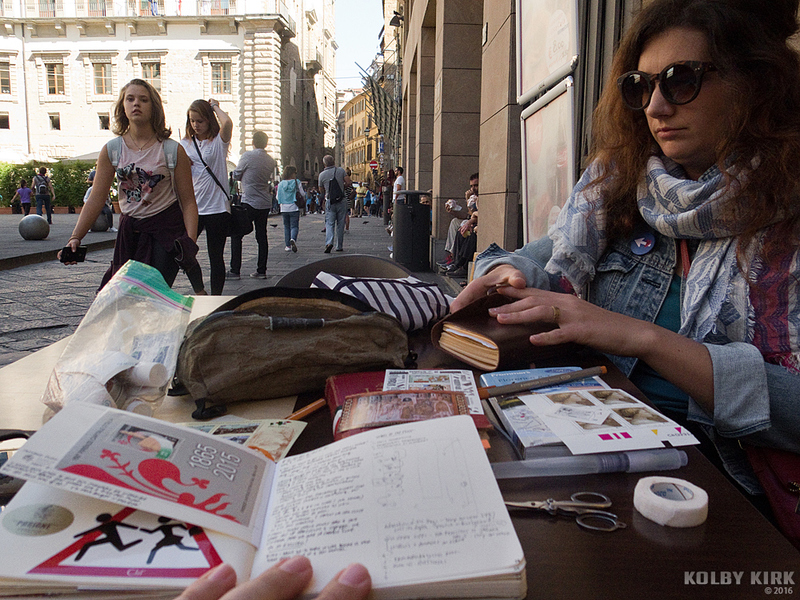 Jasmine takes a moment to write in the margins of Street-Names of Florence by Mark Roberts, a book she found in Paperback Exchange, an independent English-language bookshop we stumbled upon in Florence. She’s also carrying a bag from one of the great paper stores found in Florence. 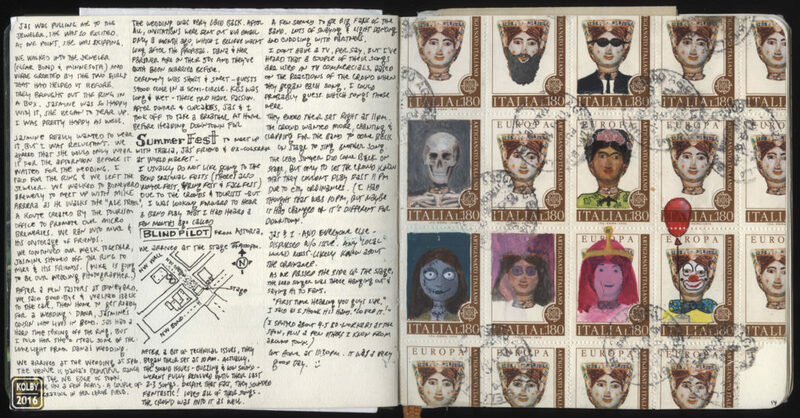 Below are a few images of my travel journal. I’ve blurred out some of the writing that wasn’t meant for public eyes. With all of the page space that this book offered, I enjoyed being able to add ephemera to the book. Before our trip, I filled a few pages with thoughts on wedding planning and other personal events leading up to the wedding. 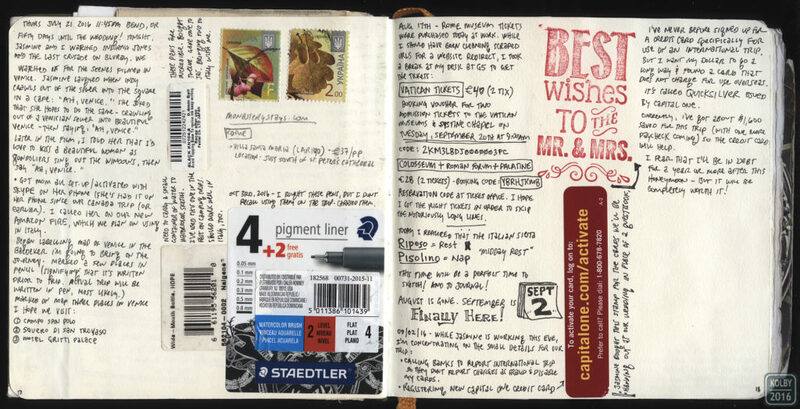 This page includes a few stickers from art supplies purchased to be used on the honeymoon, such as the labels from a Pentel Arts Hybrid Technica 0.4 mm, the pen I used for most to write in this journal. On the left, a sketch of a train waiting room, drawn while (you guessed it) waiting for a train. On the right, a postcard purchased on a day-trip into the Swiss Alps. It’s difficult to see, but an interesting flower I found has been taped into the book as well. I added these 1974 Italian postage stamps (right) to my journal before knowing what to do next. I found the stamps bizarre, yet intriguing. I had fun modifying a few. The US Postal Service recently released red and white heart Forever stamps that we used for our wedding invitations. After using all 20 stamps in a block, I added the remaining frame into my journal and had it postmarked by the post office the day I sent out all of our invitations. I filled the frames with small watercolor, pen and ink illustrations and the lyrics of a song that means a lot to Jasmine and me. Being as this was our Honeymoon, I didn’t journal all the time. 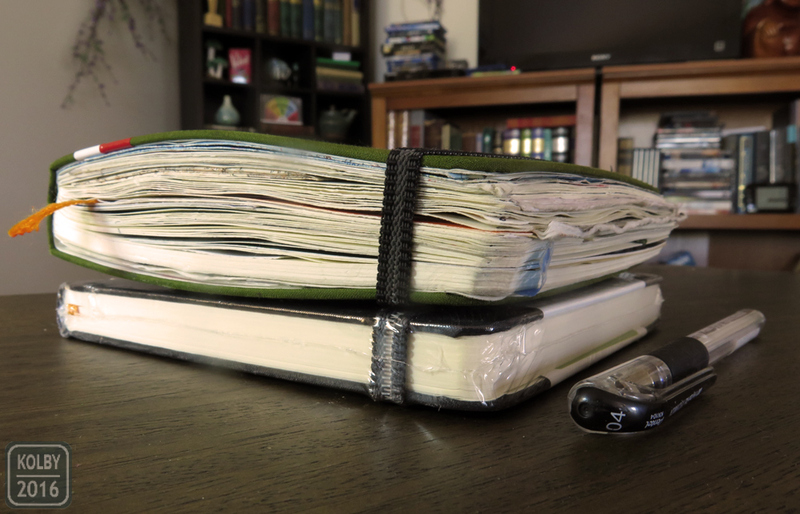 I’d try to leave blank pages to keep the journal somewhat chronological, but sometimes adding pages was necessary. On the left is an insert I made from some of the beautiful paper we purchased while traveling. 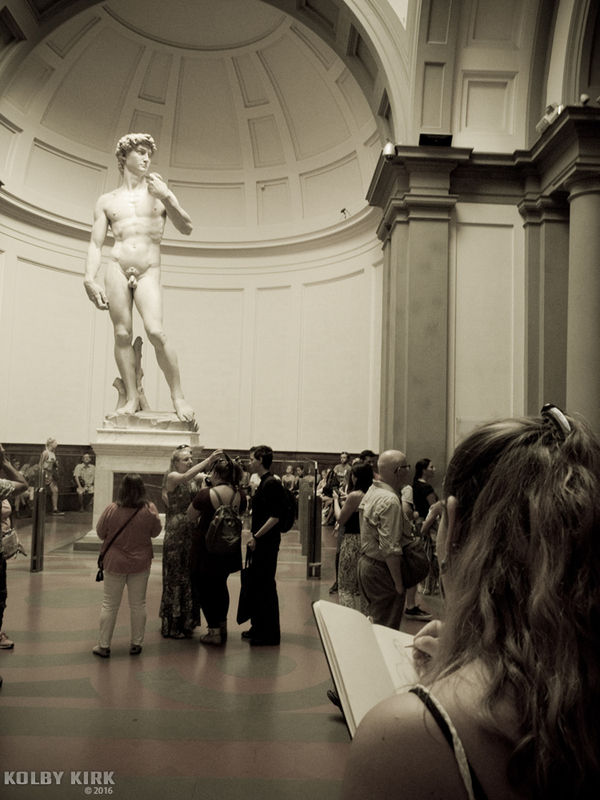 On the right is a quick sketch of Michelangelo’s David. I wasn’t the only one who put down their cameras and picked up their journal to capture the moment. 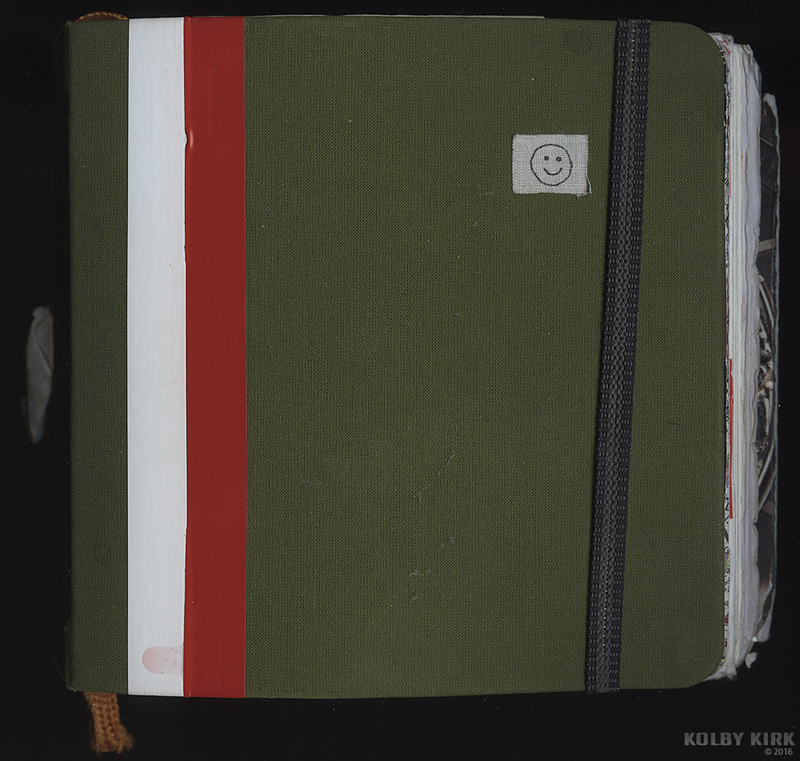 I had a lot of fun experimenting with this journal, including writing in the book vertically. 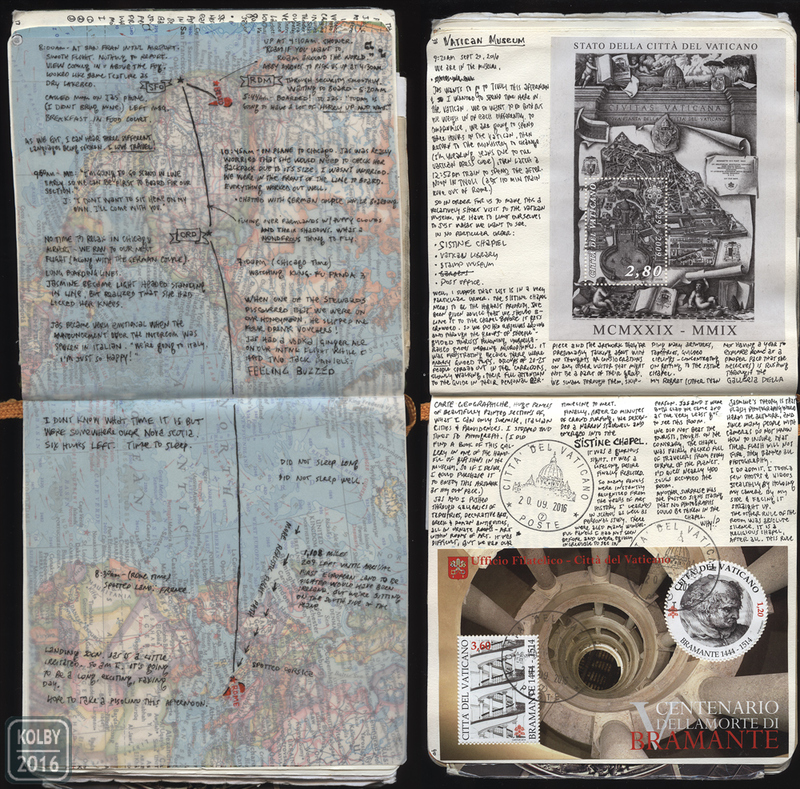 On the left page spread, I glued in a vintage National Geographic map, then pasted in a vellum overlay. 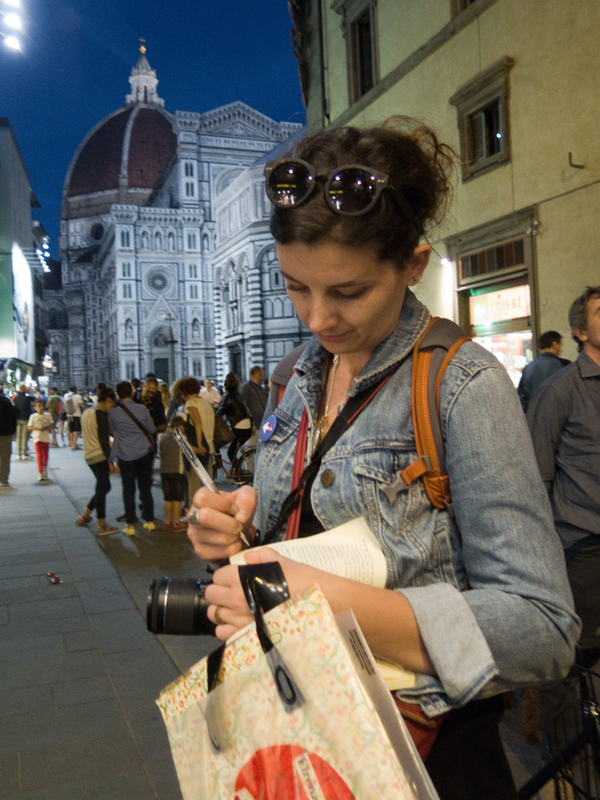 The writing was done on the long day of flights from Central Oregon to Italy. On the right, a page written after exploring the Vatican with both vintage and current Vatican postage stamps. 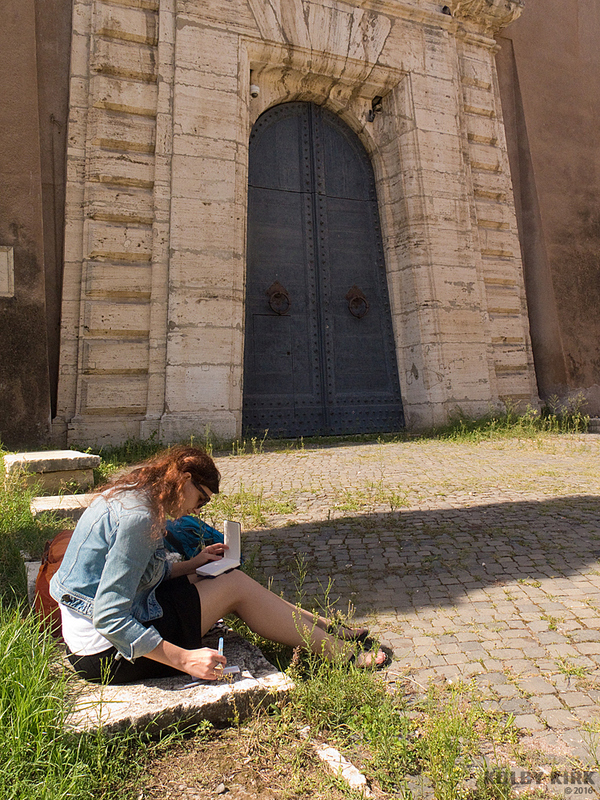 I was able to get the journal page postmarked at the Vatican Post Office. 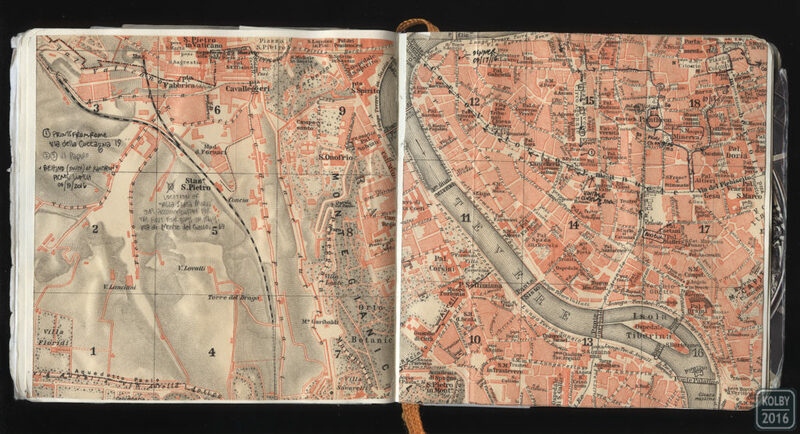 I added vintage Baedeker street maps of Rome into the journal and enjoyed comparing today’s Rome with that from the 1930’s.